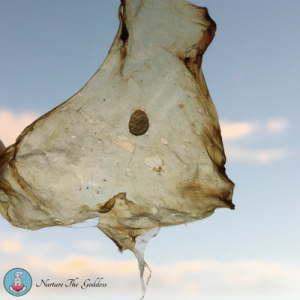 What you can see here is a dehydrated yolk sac in the membranes (bag of waters) of a placenta. This is indeed pretty special. On Tuesday evening I got a ‘heads up’ message from my girlfriend who was in labour to say that she was heading into the hospital. Not more than an hour later, 9 days past her estimated due date, her daughter was born peacefully in the bathtub. My girlfriend had chosen me to prepare and process her placenta into capsules. I collected the placenta and the whole way home I just couldn’t wait to look at it. I had excited butterflies in my stomach and I couldn’t wipe the smile off my face. I do get excited to have a close up look at all the placentas I process as they are all so amazing and tell an individual story; but this one had me particularly excited. Fetal side of the placenta. 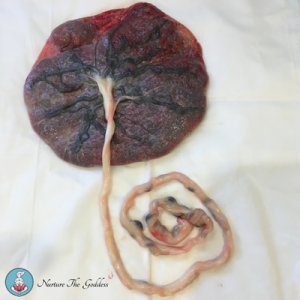 You can see the succenturiate lobe on the top left hand corner of the placenta, along with the true knot about 4 inches in from the end of the cord. I soon discovered that this beauty had a gorgeous long cord containing a true knot, a small succenturiate lobe and the ever elusive yolk sac – three quite rare variations of ‘normal’. You can read more about her findings HERE. 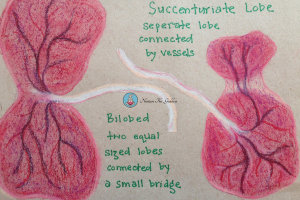 A succenturiate lobe is a smaller ‘accessory’ lobe separate to the body of the placenta connected by vessels. The estimated incidence of a succenturiate lobe is approximately 2 per 1000 pregnancies. (Dr Bruno Di Muzio and Dr Yuranga Weerakkody et al). I was excited to see the two above variations but then upon closer inspection I spotted a tiny white oval… The yolk sac. 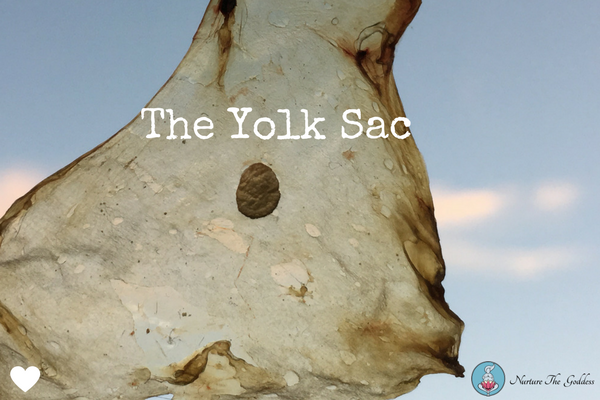 The yolk sac is the first element seen within the gestational sac during pregnancy – usually at about 3 days gestation. In the yolk sac the first embryonic red blood cells are formed and capillaries begin to grow, from which later the entire circulatory system is formed. The yolk sac performs the role of primary liver and produces proteins, which are very important for the development of the embryo. The growing baby is nourished by the yolk sac during the first weeks of pregnancy. A portion of the yolk sac is incorporated into the primordial gut of the embryo during the fourth week of development. Somewhere between the 7-12 week mark (jury seems to be out on this one) the growing baby starts getting its nourishment via the placenta. At this stage the yolk sac becomes redundant, reduces slightly in size and ‘disappears’ or is reabsorbed into the placenta. 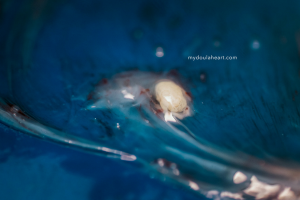 BUT, sometimes, quite rarely it seems, the yolk sac can be seen in the placenta as a 1-5mm oval shaped white body situated between the amnion and the chorion (the two water veils) either on the fetal side of the placenta or in the water veils itself. 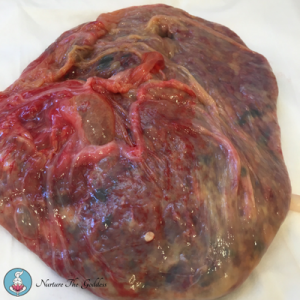 This is the maternal side of the placenta with the membranes wrapped around. You can see the yolk sac as the small, white, oval disc bottom, middle of the placenta. (Thank you Virginia, Rebecca, Anjuli, Amber, Nikki and Kirrah for volunteering your stats). On the night I was preparing this remarkable organ, across the other side of the globe, in the state of Louisiana USA, a fellow doula/encapsulator, Jennifer Wakefield of My Doula Heart was prepping an amazing placenta containing not only a succenturiate lobe but also a yolk sac! (What are the odds?! Apparently quite high because Jennifer is a placenta variation magnet!). Whilst I was thinking to myself ‘Oh, I wish I had a good camera to be capturing this magic’, Jennifer was in fact snapping away with her good camera capturing her magic. 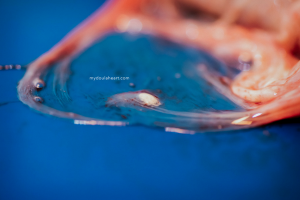 I have permission to show her pics here as they are absolutely stunning images which give you a fabulous close up look at a yolk sac. The human yolk sac. Jennifer Wakefield. My Doula Heart. Isn’t it just simply phenomenal? I really do feel blessed to do this work. Every time I receive a placenta I feel like I am on sacred ground. I dehydrated this little yolk sac and kept it separate to the rest of the placenta so the beautiful parents can have the opportunity to see with their eyes and hold in their hands a little piece of the first moments of their childs existance in this physical plane. The human body and the way we are created is nothing short of phenomenal… it never ceases to knock my socks off!